This second edition of scholar Arthur Goldschmidt presents a concise survey of Egyptian history since the mid-18th century. 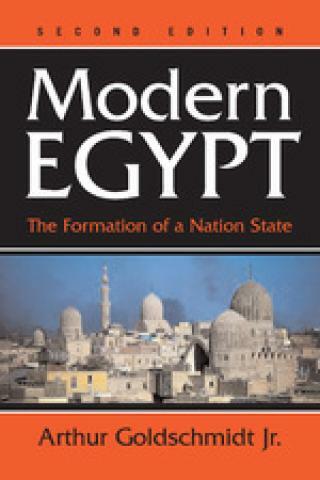 It focuses on Egypt's evolution as a nation-state, dispelling common misconceptions about Egypt's modern history. Professor Goldschmidt calls upon recent Egyptian and Western scholarship to document pivotal points, such as the 1952 revolution, and to illuminate controversies, such as those surrounding Sadat's role in the 1973 war with Israel. Modern Egypt is anecdotal as well as authoritative, covering social history, religion, politics, economics, military history, geography and even the psychology of selected leaders. Faruq's impotence, Nasir's paranoia, and Sadat's glamour are all presented as they relate to policy motivations and outcomes. Modern Egypt paves the way to a clear understanding of events leading up to the Camp David accords of 1978 and then points beyond them to the emergent Muslim opposition, Sadat's assassination and Mubarak's regime. This book is directed to students, journalists, diplomats, foreign visitors and long-term residents, and businesspeople who need to be familiar with Egypt, its role in Middle East affairs and its involvement with the nations of the world.